For all intents and purposes I was meaning to finish my blog of Vinohrady today, but some things got in the way. Firstly my kids at the weekend and the seasonal fairground so that meant that I had to do all my running around today which I almost managed apart from an ad on expats selling a microwave oven, which we desperately need so when my offer was accepted, I had to go and pick it up hence not having enough time to complete my last stage of the Vinohrady saga and lastly, one of my students rang me up and asked me if I wanted to go and see the Sparta/Slavia derby at Letna, well hell yes! so that about sums up my battle with time and being able to delegate my priorities, which I failed at completely and I am very sorry to all my fellow blogettes who have been diligently following and supporting my ego by reading my postings on a regular basis, oh BTW and I know how this is especially going to annoy one particular blogette, who is more affectionately known to me as The Dude, could you all introduce me to a couple of your friends especially unknown to me kinda friends. Lets spread a little more love around and keep my ego flush. Regarding the blog, clearly it isn't finished on time and again I am so sorry for that but I promise you that tomorrow late-ish, I will have completed it for your perusal. Finished finally, after dragging my sick body around the last remaining streets. There is nothing more to say about Vinohrady than what has been mentioned previously, only to say "it is a bloody large area to cover" but for one who used to live there it is a very nice place to live and if you are not impressed by the stylish buildings from the renaissance, gothic and baroque. You will also be impressed with the green areas that are dotted around and which come to life in the warmer months such as Riegerovy sady and Havlickovy sady. 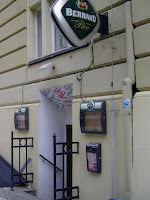 There are so many places to visit in Vinohrady as you have probably read about in previous posts so the main reason for choosing restaurant Pasticka is that it was nearly 12pm and I was bursting to go to the loo and also it did look really inviting from the outside or it could have been the large Guiness sign and I do like places that you go down into them. I am a hobbit by nature I guess. and so oozingly nice. The staff were very nice, tipping also helps to create this feeling but not in this case. They were very friendly, and the low lit woody feel about the place says come again we would love to see you, . I have been here before, with my best mate (The Dude) and his fiancee, who are getting married in July I think, yes it is July. My SVG confirms it. We had been to a wedding shop to get fitted for the wedding and on the way to the metro we stopped in here and they had some breakfast and I drank wine. Did I also mention that it was a late breakfast. 12.00pm to be precise, so relax. I am not an alcoholic, it just helps me to relax. This time though I went with my SVG and she ate because it was after my 6 o'clock watershed and i drank wine, again just a coincidence. She had the seafood tagliatelle which was too basilly and without any other seasoning. It was well presented as was everything there but the quality of the food was a little disappointing compared with the overall feeling we had when walking in. It is a nice place to go and have a glass of wine and something light and the service was very good, so a thumbs at half mast for the food but a big thumbs up for the general atmosphere.